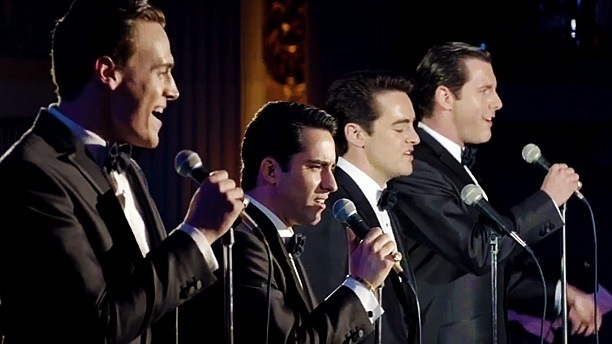 Director Clint Eastwood's film adaptation of the Tony-winning, hit Broadway juxebox musical, Jersey Boys, loosely based and inspired by the real-life rise of singers Frankie Valli and the Four Seasons' ascent to stardom is absolutely ridiculous. It succeeds and fails wholly based on the general idea of adapting a big ensemble musical to the big screen and struggling to keep it cinematic and true to its song and dance numbers while using its actors to the best of their abilities. It's artificial without being artful, lacking the pop and polish of the original as it heightens mediocre melodrama over musical flourishes. I couldn't help wishing for moments of non-diegetic music and characters spontaneously breaking out into song. Reprising his award-winning role from the musical, John Lloyd Young (age 38) plays Valli from sixteen to sixty, and while an unqualified talent, he lacks a certain screen presence to carry a two-hour film. Unfortunately, he looks forty-ish the entire time as the bulk of action takes place in the 1950s during the band's young adulthood and rise. Filling out the Seasons are Erich Bergen as Bob Gaudio (who later sports a Evil Spock style goatee and mop hairdo), Michael Lomenda as Nick Massi, and Vincent Piazza as Tommy DeVito (the film's standout and only member not from the stage play), all of whom are talented veteran actors saddled with difficult performances requiring all their skills that don't quite work on camera edited altogether. Its first half is the most successful portion, playing off as a sort of bizarre gangster musical mashup with equal parts Goodfellas and The Sopranos infused. This self serious tone drags the second half down from a enjoyable first act. What makes the musical so fun and theatrical burdens the film as a conventional biopic with hallmarks of Ray or Walk the Line. The "four seasons" structure of each member (with their own fatal flaw) narrating and telling a different era and point of view of the group's development is forced and unnatural as Eastwood eschews the musical interludes and song and dance numbers for diegetic scenes of countless live performances and studio sessions (where the cast and music performed live on set). Quickly, the timeframe is compressed and characters age dramatically while looking more or less the same with longer hair and period appropriate attire. People fall in an out of the men's lives with no explaination. Wives and children are nary given any development apart from confirming their existence. Jersey Boys, the Broadway musical, is full of energy and verve with its bright, showy nature and pop theatricality playing off the stage and crowd. Jersey Boys, the film, is flat, forced, and artificial, being loosely tied together by compromised elements, stringing the stage musical and film together. It's both far too faithful to its source material (Marshall Brickman and Rick Elice adapting their own material) and divergent in its execution. The nature of camera framing, takes, edits, shots, and pieced together performances has morphed the musical into a stilted, uncharismatic feature far too conventional for its uncoventional story. It's all over the place and works as a testament to Valli and Gaudio's classic songs that almost bind the story together along with Eastwood's ability to work with actors.